One of the best pieces of advice I ever got as a writer was about the snake in your story. The hero or heroine is only as strong as their strongest opponent. So if you craft a weak villain, your story is going to suffer for it. All fiction is derivative. There are only so many stories that exist and genre fiction really only has so many plots. Our task as writers is to find the details, to define the characters so that the story becomes original within our voice. Part of that originality comes from developing the villain's character. Particularly fascinating to me is the idea that in the villain's reality their world view is right and just. Serial killers, mass murderers, politically motivated assassins, whatever their poison may be, the villain truly believes that they are working for the greater good. Their conviction in their actions is what makes the story believable and gripping. But it can't just be that the villain is properly motivated and righteously just. The hero/ine must be smarter, stronger and faster than the villain. What makes a seriously satisfying read is the book that delivers a strong villain and the even stronger protagonist who triumphs over that villain. As readers we need that payoff. Our hero needs to vanquish that fictional snake and be the victor. Otherwise, as a reader we have the sense of being let down, disappointed in our main character. 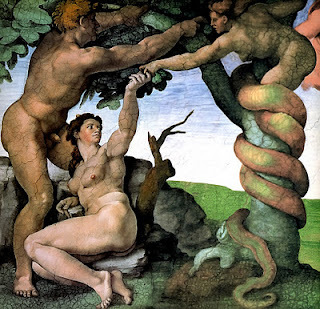 So the next time your hero or heroine is tempted by the apple, let go of that compulsion to stop them, and allow them to embrace the snake in their Eden. great points, and WOW< what an illustration! Hannibal is a perfect example especially because we watch the balance swing so subtlely as clarice become stronger or discovers her strength. What a fantastic reminder, Lisa! The stronger the opponent, the more satisfying the victory.